Helmuts Reef is located at the entrance to Steffen Strait. This is located between Selapiu and Binnege Islands, west of Cape Jeschke. It is a 40 minute run from Nusa Resort at Kavieng (New Ireland Province, Papua New Guinea) in the dive boat (at 43 km/h). This dive is dependent on having an incoming current. On the day that we planned to dive it, the current was too strong to dive when we first arrived. 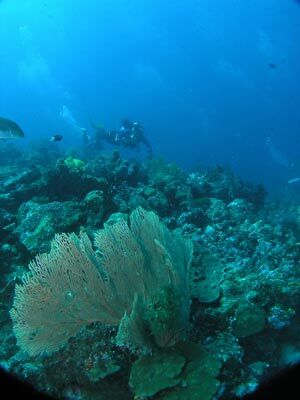 Instead, we dived at Matrix and then came back to Helmuts to dive about three hours later. 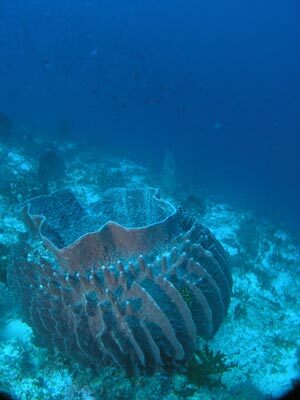 The reef comes up from over 40 metres on all sides and appears to be perhaps 100 metres square near the top. There is a mooring on the shallowest section (eight to nine metres) at GPS S2° 40' 55.3" E150° 30' 50.1" using WGS84 as a datum (not real accurate). The usual way of diving here is to gear up and then the boat runs about 100 metre forward of the mooring. All divers drop over the side together and immediately descend to the bottom. On the day we did it, the current was still very strong and I could only just swim against it on the ridge of the reef. We dropped to a slope on the western side that then has a vertical wall. Here you could swim into the current towards the south but it was not something you would want to do for all the dive. Straight away we saw a number of sharks, a huge dog-toothed tuna and some trevally. This wall has some gorgonias and sea whips. After about 25 metres you start to head around to the east. This is on the southern side of the reef on the slope. The current was a fair bit stronger here. You are given reef hooks to use on this dive. These are like huge J shaped fish hooks with about a metre of cord attached to a clip. You clip this onto yourself and when you want to stop for a while, you hook the reef hook onto a piece of dead coral and inflate your BCD a bit. Then you hang there, watching everything go past. It is even better if you have a bit of cord to extend the line a couple more metres. At this spot lots of sharks can be seen swimming up and down the reef. It is said that the best times to see sharks are early morning and later afternoon, but we saw quite a few. We also had a lot of barracuda and trevally as well. 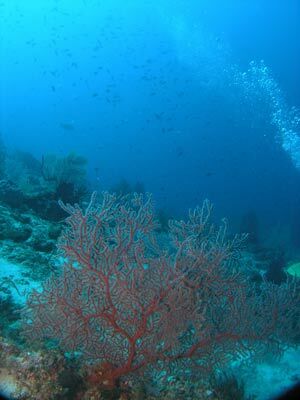 The southern side of the reef also has some nice gorgonias and sea whips but due to the current it is almost impossible to take a photograph of them. Finally, your bottom time at the depth you are at will be up. This is not a dive where you really want to get into decompression (as I will later explain). Ascend up the reef a bit more and hook back in (make sure you remember to remove the hook before you try to move!!). Spend some time here before heading back to the summit of the reef. 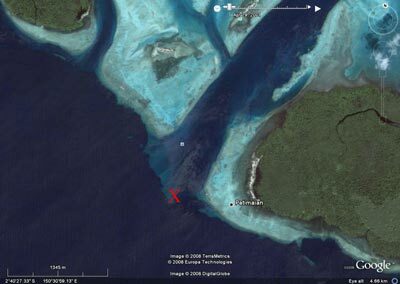 This is where the mooring is located. On the top of the reef, which is in eight to nine metres, the reef is a bit bare, so there is not much point staying here for too long. Once you hare back on the mooring, you will really appreciate the fact that you have not gone into deco as it is very hard to hold onto the rope for your safety stop. Five minutes is more than enough time to do this. When you decide to ascend to the surface, it is important to stay on the mooring line till you are on the surface as otherwise you may miss the boat. Lines are put out both sides of the boat to grab hold of while you work your way to the rear of the boat and while getting rid of your gear. This is an excellent dive, but not one I would recommend for a new diver unless they are under close supervision by an experienced diver. I would also recommend that unless you are really capable, you should not take your camera as this can add to problems caused by the current. Visibility here was over 25 metres and water temperature 29°C.